When we want to be better at something, we study and practice for it. Running is no different. When we want to finish a certain distance or achieve a certain feat, we should train for it. Training should be smart too. You shouldn't just run random distances at random pace for training or else you wouldn't be able to qualify what all you are training is for. You should have a calendar of activities or a training plan and follow it. In this way, you are on step closer to actually achieving your goal distance or finish time. There comes a time at a runner's life when he is tired of winging it or just finishing a distance. He may want to go a longer distance or He may want to run faster. In this case, the runners must determine his goal. My first running goal was to finish a 5k race. I ran every other day 2 weeks before the race. I didn't track my distance. I just ran. I wanted to prepare my body to run 5k but I didn't have a plan. Despite finishing it, I wasn't sure of achieving my first 5k finish until I actually do it. An example of a first 5k training plan is this Couch to 5k Plan that turns a sedentary fellow into a 5k running. Training takes 3 month but this program assures you that you will have a strong 5k finish and gives you the confidence of being able to achieve the feat before doing it. 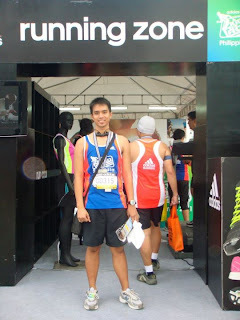 I have proven that training prepares the body to achieving when I was able to achieve my 5k PR at the Adidas KOTR 2011. I finished at under 30 minutes. Before the event, I ran every other day following a 5k in 20 minutes plan. At first, I tried to keep with the pace from the training plan but it was too fast for me so I stuck with the distances and the speed work but not with the pace. I was able to break my PR despite not being able to reach my goal. Just a few months ago, I trained to break my 21k PR at the Rock and Roll Half Marathon Philadelphia 2012. I followed a training plan for 2 hour finish. I didn't follow the training plan on the dot since it was too fast for me and I didn't have the schedule for long runs. Since I didn't follow the plan, I was doubtful to finish to break my PR. This was also my first 21k without my pacer and ka-tsismisan CJ so I had no idea how I would perform. 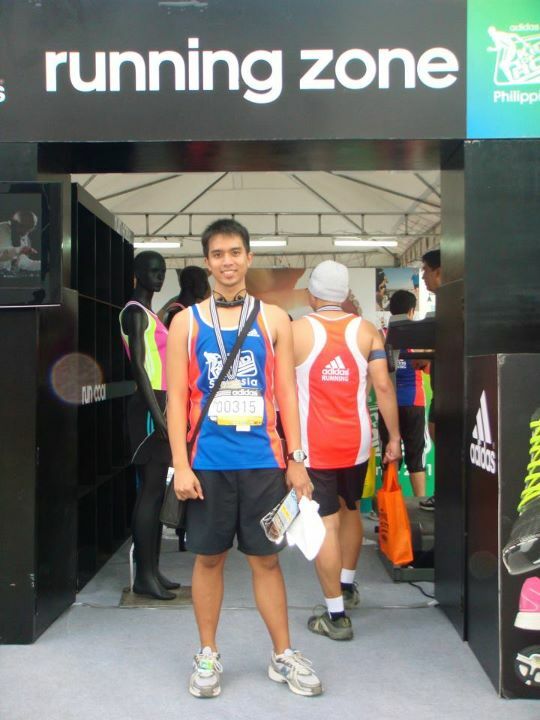 Surprisingly, I ran the whole 21k and finished within my goal a sub-2:30 finish. Last year, I was able to attend the Bull Runner Dream Marathon (TBRDM) where some of my team mates finished their first full marathon. This marathon is an event especially done for newbie marathoners. They have training plans, training runs and running seminars to support you on your first marathon. On that day, I felt that a marathon seems not for me. Then came September 2012 and I was one of the runners signing up for a slot in the 2013 batch. I figured after 2 years of running it was time for me to achieve this feat. Also, almost all of my blogger friends had finished one except for me. My running buddies had helped me get a spot. I actually got 2 thanks to them and I paid them as soon as I could. CJ helped me in claiming my kit and when I got the training plan from him the night before my return to the US, I was surprised to see that the training plan wasn't that demanding. So those who have been running for a time now, you better consider doing the TBRDM. I missed a few maintenance run and LSD when I was recovering from my half marathons in Philadelphia and Delaware. And I skipped 2 training weeks after my Rehoboth Beach Marathon and during the Christmas season. Come 2013, I did my first maintenance run on a Thursday morning and I haven't missed a training run ever since. The heat of Manila is welcoming for me. I would definitely pick this heat over the deadly cold of East Coast USA. A few weeks ago, I attended my first and only LSD with the TBRDM batch mates. I planned to paced with a friend or even all my PRC team mates but I can't find any of them when I arrived in Nuvali. Luckily, Nathan spotted me and we paced the first 2 hours of our 3 hour run. I followed the 3-1 galloway slow group (there were a 4-1 fast, 4-1 slow, 3-1 fast, 3-1 slow and a 2-1 group) but we lost them on the first 2 hours of the run. I lost Nathan in an uphill route but I caught up with the 3-1 slow group. I paced with them until they ran too fast and I lost them again. At that time, Nathan was far behind me and I was pretty much alone with a few runner within my pace. I continued to do 3-1 galloway until I arrived at the Nuvali starting point. Just in time as Coach Lit, the LSD leader, was doing cool down stretches. It was in this event that a marathon is not a buddy activity. It is an activity that proves how strong you are on your own. Some people could do it together but then, I decided to do it at my own pace, following the concepts I learned on that run. I'll find my friends on the way but this was going to be my own battle against fatigue and muscle stress. Nathan made it to the shuttle we rode in the nick of time and he proved himself strong on that day too. I continue to do training until today and strictly following the training plan. I don't go beyond what was asked since I believe the Coach who created the plan knows what he is doing and I wouldn't go over board by doing too much and get injured. When the plan says 2 hours, you won't find me doing 4 hours. TBRDM has produced marathoners with that training plan and I'm going to be one of them. Also, following the training plan had made me confident that I was gonna be able to do great at the event on February 24. I try not think about negativity as I may invite negative energy. C'mon training gave me good results then it will do so again and again. I had become a Jeff Galloway fan since I learned about his run-walk principle from the TBRDM alumni from PRC. Following his expert advice, my goal for my first marathon is to finish. No time goals yet. But I have my eye on a time goal later in the year but that merits another blog entry. In connection to my goal, I am trying to veer away from late night outs and alcohol (with the exception of the end of January Baguio Trip) so my lasenggero and gimikero friends would not hear from me until the end of 1st quarter. I'm also hanging out more with myself, my running friends, my running teams and "athletic" friends. With TBRDM almost a month away, I am continually preparing myself for it and making sure I am ready. I'm gonna finish that race and the title "marathoner" will be mine.